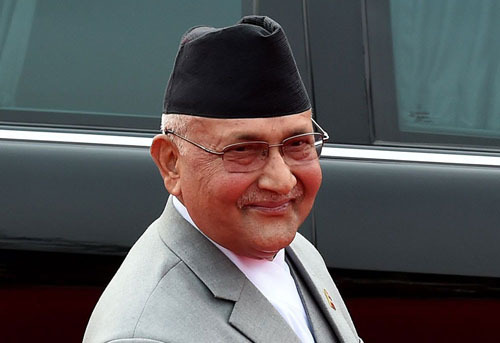 Beijing (21 June 2018) – Prime Minister KP Sharma Oli has said that political parties hold the key to development, prosperity and good governance, and they are the lead actors. They not only steer the present political course of a country but also shape its future direction, he said. 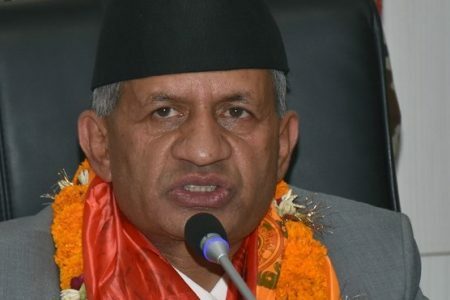 In his speech, the Prime Minister dwelt on four main aspects: the role of party school in generating innovative ideas; role of political parties in ensuring governance and achieving prosperity; Nepal’s own experiences in pioneering revolution and championing the cause of prosperity; and socialist movement in the global context. We are happy to see China’s unprecedented growth and development over the years. We are observing closely the progress made within the framework of ‘socialism with Chinese characteristics under the leadership of President Xi Jinping. I believe that your two centennial goals have laid a strong foundation to achieve the ‘Chinese Dream of Rejuvenation. And, the realization of such a dream will have a huge significance for the socialist movements worldwide. The strong emphasis put on purity of party by comrade Xi Jinping in reinforcing his unwavering determination to fighting against ‘tigers’ and ‘flies’, and his strict instruction to the cadres to serve the people with integrity, reflect the CPC’s clear vision on party’s role in governance. The seventy-year long history of communist movement has experienced highs and lows. Nepal Communist Party played an important role in overthrowing the Rana regime; led strong peasant movements; opposed foreign interference; and struggled for people’s rights in 1950s. It experienced painful series of division and disintegration in 1960s. The Jhapa Uprising ensued in early 1970s which proclaimed a bold rebellion against monarchy and laid a foundation for building and unifying the communist party on the basis of a new ideology. From the 1980s, a serious ideological discussion began on inventing a unique path of Nepali socialist movement. As a result, we propounded our distinct and innovative way for Nepali revolution under the leadership of comrade Madan Bhandari. International communist movement was facing an upheaval at the time when the ideology of People’s Multiparty Democracy was being propounded in Nepal. Communist parties pursuing armed rebellion had been facing severe setbacks. Apparently, the movement was facing new questions and challenges. Deviation and defection from Marxism would not have been the answers to those questions. Neither would the problem have been solved by dogmatic recitation of the classical texts. Based on the assumption of innovative use of Marxism, we focused on the distinctive attributes of Nepali society and practiced Marxism accordingly. This left an extraordinary mark in our society. The Communist Movement in Nepal was gaining popularity.Nepali communists emerged as the largest party in 1994/95 elections to run the government which was very successful, although its tenure was short. The idea of People’s Multiparty Democracy contributed enormously in popularizing the communist movement, establishing its legitimacy and steering the movement ahead amidst adverse circumstances on both domestic and external fronts. The credit for this goes indeed to the thoughts propounded by Madan Bhandari. 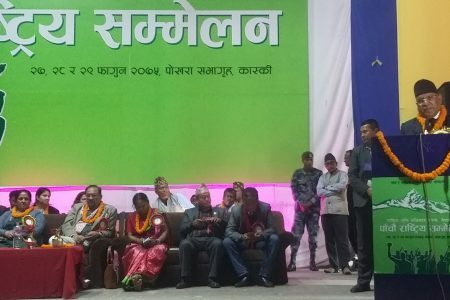 After a series of discussions and debates between CPN (UML) and CPN (Maoist) on resolving the political problems in the country in the middle of the last decade, the basis of cooperation between the then seven mainstream parties and CPN (Maoist) was formed. This cooperation drove the overall political course leading to the historical political change in 2006. As a result, the peace process began in Nepal. The happy outcomes of this decade-long process are: first, the promulgation of Constitution of Nepal through a democratic process, incorporating the values of social justice, fundamental freedoms and socialism-oriented vision; and secondly, the historic unification between CPN (UML) and CPN (Maoist Centre) which resulted in the formation of the strongest political party in Nepal. Political attributes such as ideological direction- Marxism-Leninism, programme- people’s democracy based on multiparty competition and democratic values; main responsibility – socio-economic transformation and building a strong national economy with socialist orientation; and political direction- achieving supremacy through peaceful democratic means along with overwhelming mass support, have been the unique features of Nepal Communist Party. Fourth, protection, promotion and innovative implementation of Marxism is vital. We must always be open to new ideas and thoughts. This is where innovation and creativity prosper. Chinese comrades very often talk about the three major ideological junctures in the Party’s history- seventh national congress of the CPC and adoption of Mao Zedong Thought, which led the creative innovation of Marxism in China; policy of openness and modernization by Deng Xiaoping, which heralded a new era of development in China; and the vision of ‘Socialism with Chinese Characteristics’ and Xi Jinping Thought for a New Era. In Nepal, we also have similar experiences and benchmarks of ideological innovations. The Jhapa uprising of 1970s, which opened up new pathways to reorganize and revitalize the then fragmented and divided communist movement, the rise of peoples’ leader comrade Madan Bhandari and his new ideological innovation -People’s Multi-Party Democracy, and the historical unification of the CPN (UML) and CPN (MC) are such major benchmarks of our movement. The role of a communist party is unique and special like a torch bearer. It has led the revolution and will pioneer the socio-economic transformation and prosperity in respective countries. That’s why, the leading role of the communist party is necessary for prosperity and governance. We think such a role can be obtained through competition and initiation. Panchasheel – the five principles of peaceful co-existence – guide our friendly and cordial relations. We take pride in pursuing these principles for achieving peace and progress in a harmonious way.